The Classic and Sports Car Show was popular but ultimately unsuccessful, and the decision has been taken not to run the event in 2011. 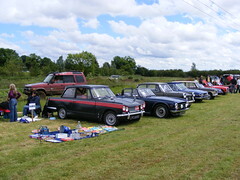 Cars at a previous event. The organisers of the Classic and Sports Car Show at Northampton & Lamport Railway would like to thank all of the exhibitors and traders for their support over the last few years. 11:00 11:45 12:30 13:30 14:15 15:00 15:45.